Thanks, Ross. This book seems to be in a library locally.. I will take a look. A few pages aren't, of course. I'll try to get them scanned. I am busy seeing if I left out any that she mentions. So far, when I search here for the relevant catalog numbers, my only surprise is how many threads I have put the relevant information in, somewhat more than this one (so far three besides this one!). Cohen lists only 3 mss. that are1440 or before, none with pictures (none have triumphs of Time). I have covered all three, with pictures, only not in this thread. One is her no. 5, BNF 549, ca. 1440, Venetian or Lombard, she says. I discussed that one at viewtopic.php?p=13428#p13428. The backgrounds and buildings are Veneto, she says, but the style is Lombard. Another is her no. 21, Bayerische Staatsbibliothek cod. Ital. 81, after 1414. North Italian. Same post, but continuing a discussion with Huck on another thread, starting at viewtopic.php?p=12920#p12920. Cohen says either a Bolognese miniatrist or Stefano da Verona , who was trained in Lombardy. The last is her no. 22, Leiden Bibliotheek der Rijksuniversiteit, BPI 2887, ca. 1420-30, Lombard (?). I discussed this one on the same post as the first, with a picture. I will continue to go through her pre-1450 items to see if there is anything omitted from one thread or another here, and if need be give links to posts on other threads. One more needed link is obvious, that to my report on Pellegrin's inventory of mss. held in France, to which I added a few other countries. viewtopic.php?f=11&t=1060&p=16250&hilit ... rin#p16250. A thread with one long post, no replies. 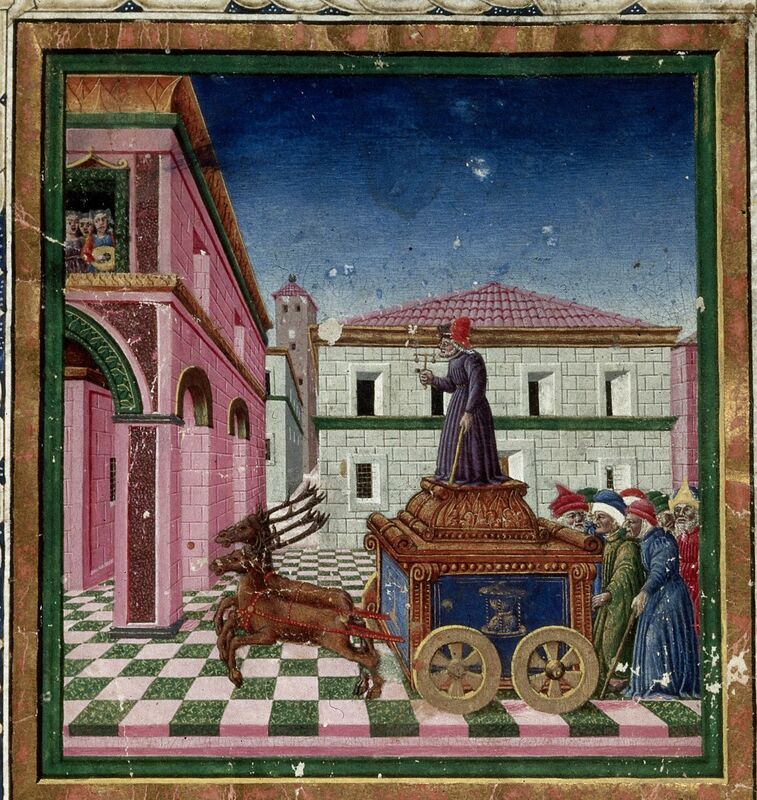 Cohen's 1441-c. 1450 Petrarch manuscripts, extracted from her book. No. 25. Laurenziana Amiat. 5, mid 15th c. Florence. Love and miniated initials starting each chapter. I didn't know about this one. No. 27, Biblioteca Nazionale Florence, Pal. 192, mid-15th century. All six. Hourglass for Time. 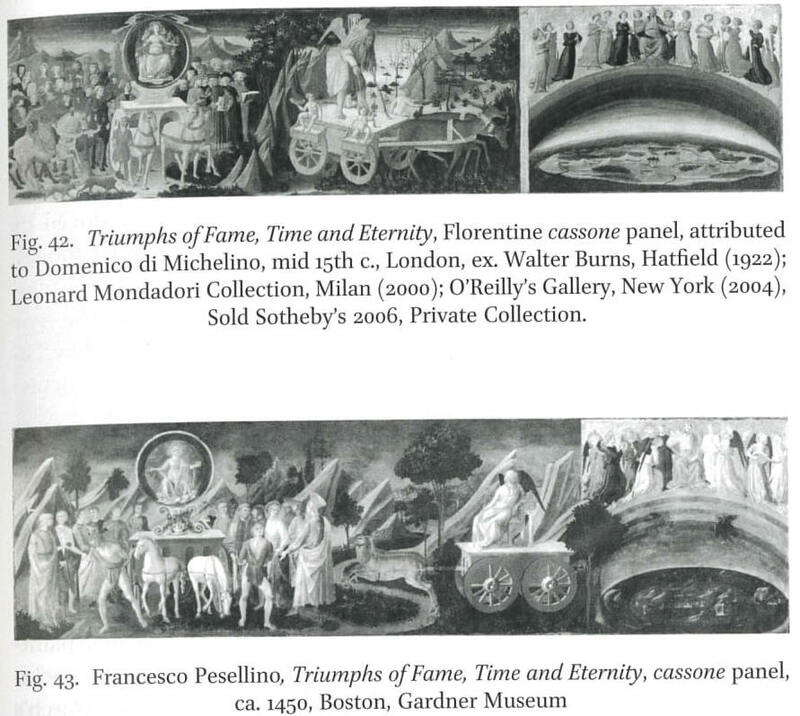 She says international Gothic-type figures crowd the scenes , similar to those of 1440s cassoni. Not sure if this has been identified here. I am not sure what "1440s cassoni" she has in mind. In the text she only shows us cassoni she identifies as "c. 1450" or "mid-15th century". See cassoni at end of this list. No. 36. Parma, Biblioteca Palatina 2663, mid 15th century Parma. Amore. related to no. 37. I didn't know this one. No. 37. Parma, Biblioteca Palatina 307, mid 15th c., North Italian. last 4 triumphs. I didn't know this one. No. 40. Rome, Biblioteca Apostolica Vaticana Urb. lat. 671, 1440-1460 (?). Florentine. all 6, probably workshop of Cherico. Not known by me. No. 44. Rome, Biblioteca Apostolica Vaticana, lat. 3157, mid 15th c. NE Italy (Ferrara or Venice). Not known, or at least listed, by me. So for the period 1440-1450, there are 7 or possibly 8 illuminated manuscripts I can't find referred to on THF by museum number. Of the ones she lists, all but one are c. 1450 or "mid-15th century", 7 or 8 are Florentine, 1 from Parma, 1 NE Italy, and 1 North Italy. In addition there are several with "second half of 15th c." or "3rd quarter of 15th c." See the link to Cohen's book, to which I will add my scans later for the missing pages. I didn't count them. Approximately one-fifth of the extant Trionfi manuscripts belong to the decade between 1450 and 1460. With the exception of three from northern Italy, all the illuminations are Florentine. She does not include in that number the three that the text (but not the Appendix) says are 1440-1450 or 1440-1460 So clearly 1450 is a watershed year, lasting for a decade. She assigns only one Florentine manuscript to a time before then, the Apollonio of 1442 (although I think there were cassoni). I do not know if she is speaking of just manuscripts with illuminations of the the Triumph of Time, or all illuminated manuscripts of the poem, but I think the latter. If so, from being mainly concerned with that triumph, she has probably left out a few. 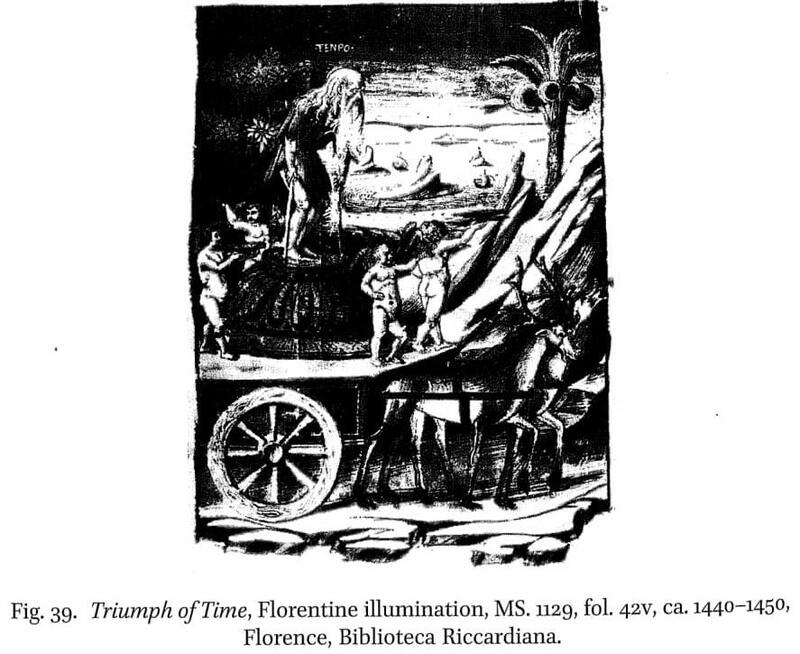 As to whether Florentines of means perceived any relationship between the manuscripts they were now commissioning and the card game of Trionifi, it seems to me relevant to observe that the game was legalized in Florence in 1449, according to Pratesi's research. I am not sure what the effect would have been; perhaps it affirms a high-culture, or at least expensive, version of what is now legitimate for the man on the street, in the way that gambling establishments now legal and open to anybody (at least in the U.S.) have special amenities for their "high rollers". 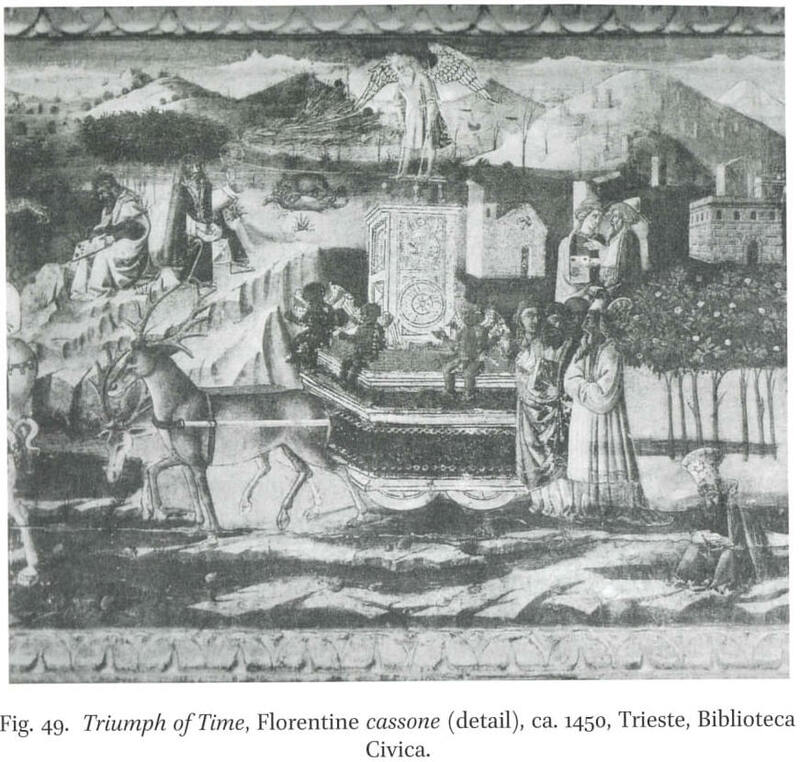 As to whether Florentines of means perceived any relationship between the manuscripts they were now commissioning and the card game of Trionifi, it seems to me relevant to observe that the game was legalized in Florence in 1449, according to Pratesi's research. 1449 ? Or 1450 ? And not only that, but December 1450, so late in the year (which ended March 25, if memory serves). Since the dates for the manuscripts are all "circa" 1450 or "circa" mid-century, it makes little difference for the point. Also, there is not a sharp divide between "legal" and "accepted", as the reason for making it legal was that it was already accepted. It is maybe like the legalization of marijuana where I live: it was already accepted, or a majority of voters wouldn't have voted for it. And law enforcement agencies had already stopped enforcement, although even now, it is still in a sense illegal, in that it is against Federal law. But now there are billboards everywhere promoting its social utility, with statistics, etc. I can't tell what difference legalization makes in people's actual practice, and I expect there is a downside I don't know about. I do notice one thing, in my age group (after 60): a new proliferation of medical options for pain relief, chronic back ache and such (with the THC greatly reduced or eliminated), without the need for a prescription, which physicians tended to give only in extreme cases, and a new trust in the safety of what one gets, at reasonable prices. In the game of triumphs, that would translate, I suppose, to an increased appreciation of the skill part of the game, and of the educational value of the sequence, as opposed to thinking of it as a way to gamble away your money to clever cheaters. Petrarch illuminations might relate to the educational value of the game, even if the concepts illustrated are not quite the same. Good find, Phaeded. That one isn't even included in Cohen's list. Today I cannot find any of her Appendix in the Google Books extracts from the book. Here is a short version of her list, minus the descriptions, for which see the links to the jpg images. I used an ocr program and proofed it. Under Britain, "Montagu e.1" may be the printer's typographical error for "Montague 1"
The following Petrarch manuscripts contain illuminations of at least one or all of the six Trionfi. Illuminated manuscripts of the Trionfi containing only decorative initials, margins and title-page illuminations of other themes (such as the Rime, Canzone or Sonetti) are not included. Other works by Petrarch, included in some of these manuscripts, are generally not referred to. Manuscripts are listed according to the country of their locations. 1 Vienna, Österreichische Nationalbibliothek, Vind. 2649,1459, North Italian. Fig. 48. 2 Vienna, Österreichische Nationalbibliothek, MSS. 2581 & 2582, early 16th c., Parisian. 3 Paris, Bibliothèque Nationale, Ital. 545 (2373), 1456 Florentine. Fig. 47. 4 Paris, Bibliothèque Nationale, Ital. 548 (7762), 1476, Florentine. Fig- 52. 5 Paris, Bibliothèque Nationale, Ital. 549 (7770), ca. 1440, Venetian or Lombard. 6 Paris, Bibliothèque Nationale, Franç. 223 (6875), late 15th or early 16th c., Parisian. Fig. 68. School. 8 Paris, Bibliothèque Nationale, Franç. 24461, early 16th c.
9 Paris, Bibliothèque Nationale, Franç. 12423 (5347)» early 16th c., Parisian. 10 Paris, Bibliothèque Nationale, Franç. 22541 (La Vallière 6), second quarter of the-16th c., French and Ialian text. 11 Paris, Bibliothèque Nationale, Franç. 12424 (2036.56), Tate 15th or early 16th c., Parisian. 12 Paris, Bibliothèque de L'Arsenal, MS. 5065, es. 1498-1515. French translation. 13 Paris, Bibliothèque de L'Arsenal, MS. 6840,16th c. (after 152o). French translation. 14 Paris, Bibliothèque de L'Arsenal, MS. 5066,1ate1.5th or early 16th c. French translation. 15 Paris, Musée Jacquemart-André, MS. 17, 1.5th c. Italian codex. 18 Frankfurt (formerly Goldschmidt Coll., present location unknown), 16th c.
19 Kassel, Landes-und Murhardsche Bibliothek der Stadt Kassel, 40 MS. poet, et roman 6,1483, Parma. 20 Munich, Bayerische Staatsbibliothek, Cod.Gall. 14 (ex Mannheim), 15th c.
21 Munich, Bayerische Staatsbibliothek, Cod.Ital. 81, after 1414, North Italian. 23 Florence, Biblioteca Medicea Laurenziana, Strozzi 174, ca. 1450, Florentine. Fig. 40. 24 Florence, Biblioteca Medicea Laurenziana, Pal. 72, Dante, La Divina Commedia 8c. Petrarca, Trionfi, 1442, Florentine. Fig. 38. 25 Florence, Biblioteca Medicea Laurenziana, Amiat. 5, mid, 15th c., Florentine..
26 Florence, Biblioteca Medicea Laurenziana, Ashb. 845 (776), 1457, Florentine. 27 Florence, Biblioteca Nazionale, Pal. 192, mid. 15th c., Florentine. 28 Florence, Biblioteca Nazionale, Pal. 197,1453 or later, Florentine. 29 Florence, Biblioteca Riccardiana, cod. 1108,3rd quarter of the 15th c., Florentine. 31 Florence, Biblioteca Riccardiana, cod. 1147, second half of 15th c., Florentine. 32 Milano, Biblioteca Trivulziana, cod. 905, before 1485, Florentine. 33 Modena, Biblioteca Estense, Ital. 103, second half of the 15th c.. Illuminated in Tours (?). 34 Parma, Biblioteca Palatina, Pal. 280, ca. 1460, Florentine. 35 Panna, Biblioteca Palatina, Pann. 1648, late 15th c.. Fiorentine. 36 Parma, Biblioteca Palatina, 2663, mid 15th c., Parma. 37 Parma, Biblioteca Palatina, 307, mid 15th c.. North Italian. 38 Rome, Biblioteca dell’Accademia dei Lincei e Corsiniana, 55.K.10, (Cors. 1081), third quarter of the 15th c., Florentine. 39. Rome, Biblioteca Apostolica Vaticana, Chigi L. IV U4 (2331), second half of the 15th c., Florentine. 40 Rome, Biblioteca Apostolica Vaticana, Urb.lat. 681, between 1440-1460 (? ), Florentine. 41 Rome, Biblioteca Apostolica Vaticana, Urb.lat. 683, between 1468 and 1485, Florentine. Fig. 41. 42 Rome, Biblioteca Apostolica Vaticana, Barb.lat. 3g43, third quarter of the 15th c., Lombard. Fig. 45. 43 Rome, Biblioteca Apostolica Vaticana, Ottob.lat. 2998, bet. 1451-58, Neapolitan. 44 Rome, Biblioteca Apostolica Vaticana, lat 3157, mid 15th c., N.E. Italy (Ferrara or Venice?) Fig. 46. 45 Rome, Biblioteca Apostolica Vaticana, Barb.lat. 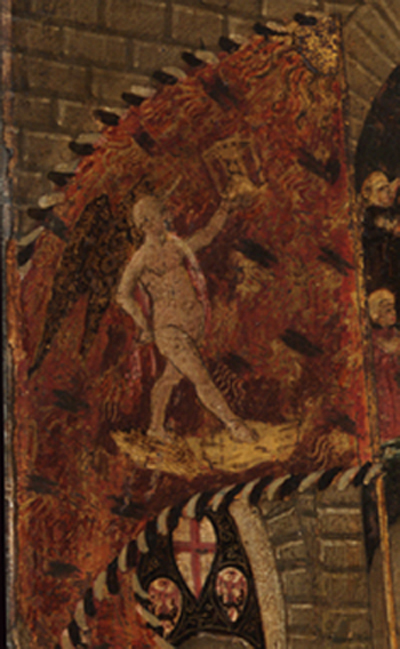 3962, second half of the 15th c., Ferrara (?). 46 San Daniele del Friuli, Biblioteca Civica Guareniana, 139 Mazz., late 15th c., Padua or Mantua (?). 47 Venice, Biblioteca Marciana, Ital. 431 (6206), 1468, Florentine. 48 Leningrad, PubUc State Library M.E. Satykov-Scedrin, Fr.Fv.XV no. 4 (formerly in tbe Imperial Library of St. Petersburg, Fr.5.3.63), ca. 1500, Parisian. 50 Madrid, Biblioteca Nacional, vit. 22-3,1508, Bolognese. 51 Madrid, Biblioteca Nacional, vit. 22-4, last quarter of the 15th c., Florentine. 53 London, British Library, Harley 5761, second half of the 16th c., Florentine. 54 London, British Library, Add. 38125, late 15th c.. North Italian. 55 London, Library of Major J.R. Abbey, J.A. 7368, ca. 1490-1500, Padua. 56 London, Victoria and Albert Museum, cod. L. 101-1947, ca. 1465-70, Padua. 57 Oxford, Bodleian Library, Canon. Ital. 62, ca. 1470-80, Florentine. 58 Oxford, Bodleian Library, Canon. Ital. 83, 3rd quarter of the 15th c.. North Italian. 59 Oxford, Bodleian Library, Montagu e.I (25403), third quarter of the 15th c., Florentine. 60 Baltimore, Maryland, Walters Art Museum, MS. 755, early 16th c., Padua. Fig. 53. 61 New Haven, Conn., Yale University, Beinecke Library, MS. 438, ca. 1457-60, Florentine. 62 New York Public Library, MA 087 (De Ricci 87), late 15th or early 16th c., Neapolitan. 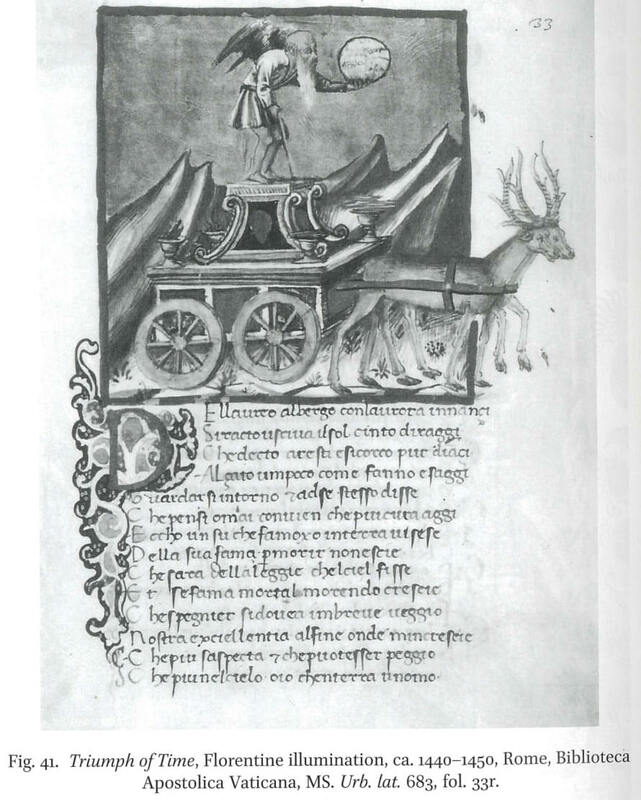 Also: I have added links to Cohen's images for the 1442 and the three she says in the text, but not in the list, are "1440-1450", as well as for the cassoni she refers to. 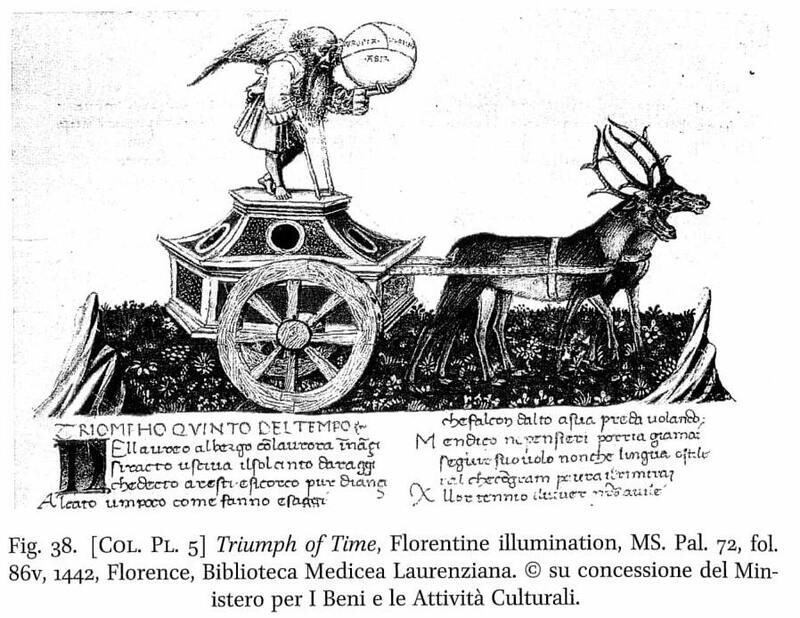 Among these, of interest are the three "northern Italian" triumphs of Time, all post 1450, that feature Helios or Apollo (one of them in the sky above an old man with an hourglass), as well as one that has a Wheel of Fortune as its representative of Time. 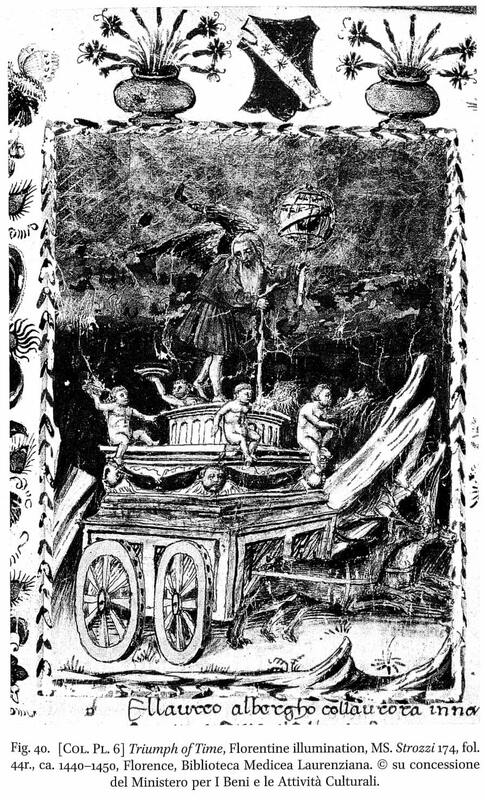 Cohen shows a 1488 printed triumph of time using a foliot plus hourglass motif, like the c. 1465 Mantua that Phaeded posted. She says it is a putto on top, but it looks more adult and feminine to me. The centaurs at the bottom are rather interesting, with their full breasts in addition to their beards. The bee seems to replace the wings. She says it is a putto on top, but it looks more adult and feminine to me.